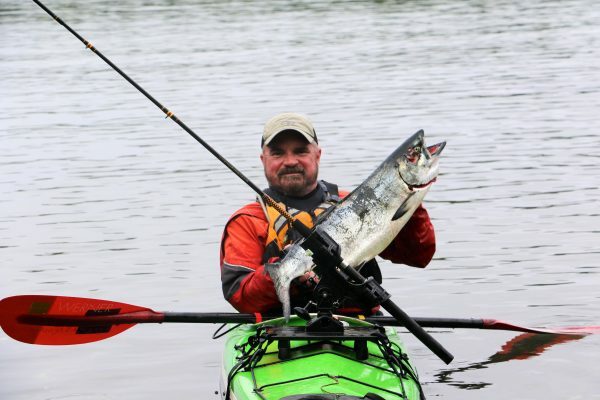 SKILS is the pioneer of kayak fishing instruction in Canada. Try it and get hooked. Fishing and kayaking are a great combination. The shallow draft, manoeuvrability, and stealth of the kayak allow anglers to tuck into shoals, shallow lagoons, and the other nooks and crannies that fish love. 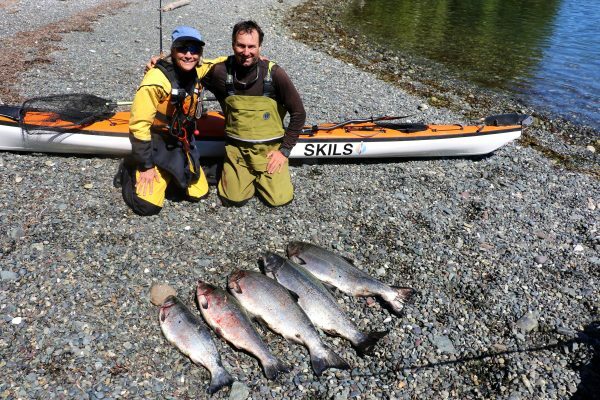 The technical and tactical challenges of fishing from a kayak offer real rewards for fishers. Its also a great way to supplement food on a paddling trip. 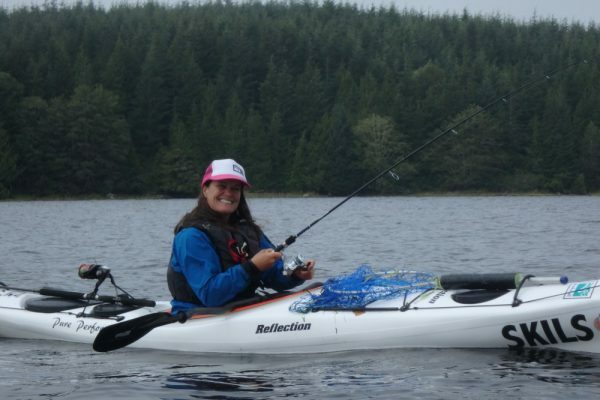 Whether you want to fish from a dedicated fishing kayak with all the associated bells and whistles, or you want to minimally modify your existing kayak for fishing while touring, our kayak fishing courses are for you. Email us if you are interested by a custom and private kayak fishing expedition from 1 to 10 days. 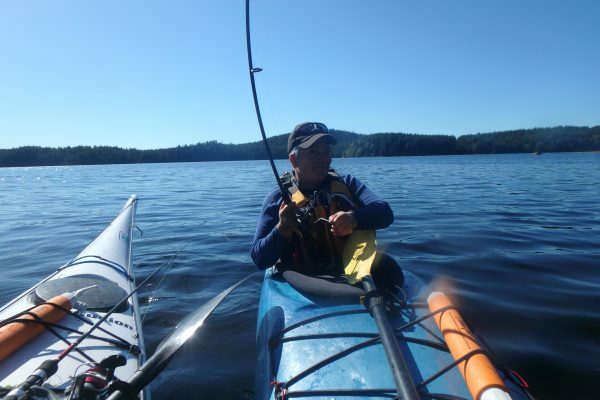 Our guided kayak fishing day trip takes place in either Barkley or Clayoquot Sound. 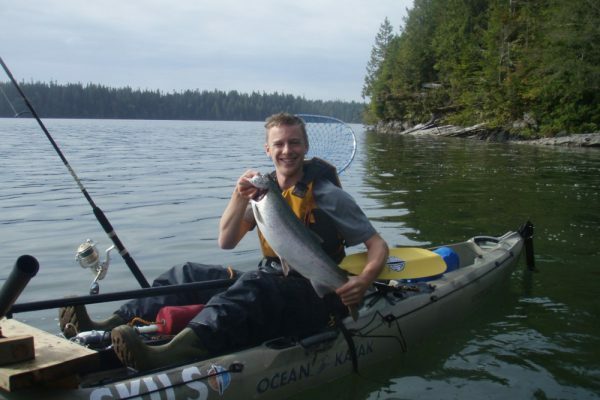 Each location is a kayak angler’s paradise, famous for its world class fishing and abundant wildlife. Learn the basics of kayak fishing in protected waters. Learn intermediate to advanced skills for fishing in coastal waters. 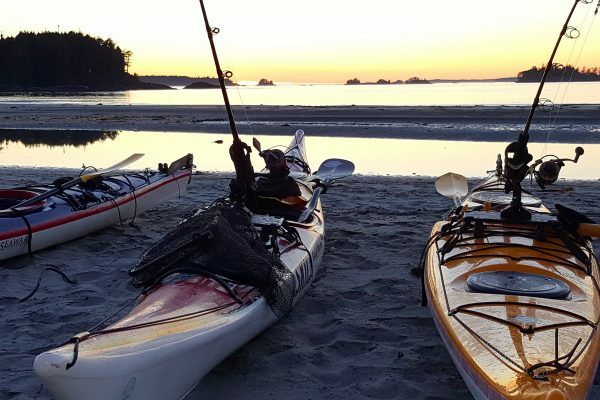 Our kayak fishing expedition take place in Clayoquot, a sea kayaker’s paradise, famous for rugged west coast features and old growth forests. On this expedition, we will be mostly focusing on Chinook and Coho Salmon as well as Lingcod and Rockfish. The Clayoquot Sound Expedition involves camping on a spectacular secluded sandy beach for 3 nights and amazing food. The remote Kyuquot Sound is a sea kayaker’s paradise, famous for a large sea otter population, rugged west coast features and old growth forests. We will be mostly focusing on Chinook and Coho Salmon as well as Lingcod and Rockfish. We will be based out of a remote Wilderness Retreat for 4 nights with beds, hot shower, dining shelter and amazing food! This expedition is not for the faint of heart. This expedition will push your mental, physical, tactical and technical skills as well as the adrenaline level. We will be fishing the world-class Big Banks of BC located 10 to 20 nautical miles off the shores of Ucluelet.